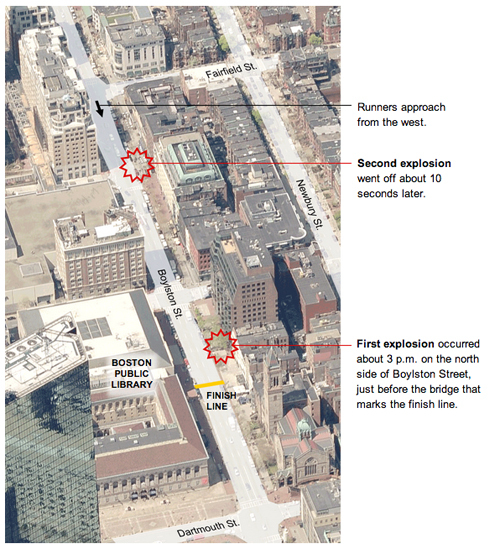 Unless you've been hiding under a rock, you probably know that on April 15, 2013 there were two explosions near the finish line of the Boston Marathon. Some of you might not be aware that I am in the Boston area. For those that do, this post is mainly to let you all know that I am okay, but I also wanted to get some of my thoughts out about the day's events. I will do my best to stick to the facts and avoid spreading unsubstantiated claims. As I write this, there have been three confirmed deaths and a large number of injured. Massachusetts General Hospital reports that they have treated 29 individuals, of which 8 are in critical condition. Brigham and Women's Hospital has treated about 20 patients. About 10 have been treated by Boston Children's Hospital. Tufts Medical Center, Beth Israel Deaconess Medical Center and Boston Medical Center also saw patients. NPR confirms 98 injuries, some very severe. Some reports have been higher, but I cannot confirm the numbers; they appear to be speculative. A large section of Boston surrounding the scene is, for the foreseeable future, closed off as authorities investigate. When this happened, I was at work. A coworker came in, asking if we heard the news. Moments later, I heard the siren of a firetruck pass by outside. I checked my Twitter feed and saw an increasing number of tweets, many of which were from various places around the world, expressing shock at what happened and hope for those in the area. Images came quickly, many without editing or warning of the disturbing and graphic nature. Many people were wondering how anyone could do something like this. Others focused on how many people ran toward the scene to help out. As time passed, naturally, the speculation began. I started to see some people claiming it was probably some religious person behind it. Conspiracy nut extraordinaire Alex Jones (and similarly minded individuals) suggested that the government was responsible, showing just how much of an callous, insufferable, paranoid jackass he is. The term "terrorist" began to show up. Speculation that it was a foreign individual or someone domestic. What surprised me, though, was how many people were saying to stay calm and not leap to conclusions. The calls for people to be rational, to avoid sensational tweets, to verify before tweeting far outnumbered the irresponsible tweets. (I have to give a shout out to Seth Mnookin, here, for his repeated efforts to teach people that early reports often turn out to be false. If you don't follow him on Twitter, you should.) That could just be in the nature of the people I follow, but it was reassuring to see. It took me a while for the initial shock and surge of emotion for the victims to settle somewhat. Even now, I'm at a loss to find the words to describe just what I'm feeling about this. I share the sentiment expressed by many that the person or persons responsible are cowards. They attacked innocent civilians, from children to the elderly. Many of the people running did so to raise money for a variety of charities, many benefiting medical research and treatment. They had friends and family there to cheer them on. People from all over the world came together with a common interest. I sit here, wondering what end this was supposed to accomplish. It certainly will not endear anyone to the perpetrator. I want so much to know who and why, even though knowing will not change anything. There will still be people who are dead or injured. There will still have been a massive impact on our medical and law enforcement systems. Our lives will go on. I want to speculate, to guess who did it and why, even though I know it would be irresponsible and most likely turn out incorrect. It would give a sense of control. And I also contemplate the whole thing from a skeptical viewpoint. This event was not predicted by any supposed psychics, though I can guarantee some of the big names are going to try to cash in on this event. (ETA: After I posted this, I came across one psychic already claiming she "saw" the bombing, but just didn't write about it.) Those crying "conspiracy", pony up the evidence. Real evidence. Not some "just so" story that plays on people's fears but is devoid of substance. 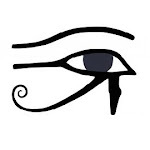 There will be fringe notions, explanations and charlatans who prey on the nervous, the fearful, the bereaved. All there is to do is to educate, to stick to the facts, and to help people to understand and make sense of things, without resorting to feel-good, but ultimately untrue, explanations. In the end, while this was a horrible, tragic event, and I hope that those who were injured recover as best as possible. My heart goes out to all those affected. If you were there, and have photos or video around the time of the incident, the FBI has a tip line set up: 1-800-225-5324.